This week on Grow Christians we’re getting ready for the Lenten Good Book Club. In Part One, Rachel Jones invited participation. 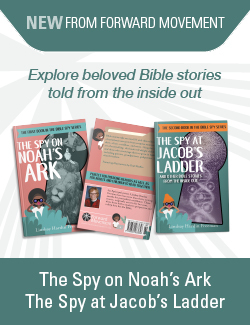 In Part Two, Melody Shobe shared her Step 1 – printing the readings and Step 2 – finding a Bible that would fit her 4 and 8 year olds. Below, she shares her last two steps to set up. Tomorrow, I’ll reflect on getting ready with teens. – Ed. Step 3: Schedule a time. Selecting a set time is an important part of any spiritual practice, so I knew we needed to pick a time if we wanted to commit to the Good Book Club. Our family eats dinner together almost every night, so dinnertime is a good time for us to engage in family commitments. In the past we’ve read family books and done Advent and Lenten practices around the dinner table, and that works well for us. So we decided to do the Good Book Club as a family at dinnertime. Even with a scheduled time, sometimes our life gets crazy and we need reminders, or we will forget our commitment! In our family, things are much more likely to happen if they are on the calendar. Our family uses iCal, so I took the time to put “Good Book Club” into our family’s calendar as a recurring event each night at 6:00 from February 11-May 20. I even turned on the “reminder” function so that my phone will alert me each night. I also set the necessary materials (Bible, reading plan and activity materials) in the middle of our dining table; they will serve as a visual reminder to engage in our practice each night. If dinner is not a good time for your family, you could decide to do the Good Book Club over breakfast, before bed, or at another set time. If your family commutes together, you could even do it in the car—there are plenty of free or low-cost audible versions of the Bible. Just pick a time that you think will work for your family, and put it on the calendar! Each night, one member of our family is going to read the appointed verses aloud. It will usually be myself or my husband, but I did select an easy Bible so that my eight-year-old can read if she wants to. I’m guessing that by the second week, she will! I ordered a set of these coloring posters, which have a rectangle for each day of the Good Book Club. We have used these posters for Advent and Lent in the past, and my daughters love them (my husband and I love using them too). We can color a square each night as we listen to the story. This both gives them us to do with their hands while we listen (which is good for the brain!) and also gives us a visual record of our discipline. Win-win! If you don’t have the means to order the posters, you could easily print out a paper with a grid of squares, and have a child draw a picture in a square each day as they listen. – I wonder what part of the story you liked best? – I wonder what part of the story is the most important part? – I wonder where you are in the story? I wonder what part of the story is about you? Our family has the materials, we’ve made a plan, and we are as ready as we are going to be for Lent to begin. I’ll be checking back in every few weeks to let you know how it’s going; I’m sure it will be an adventure. How are you getting ready for the Good Book Club? Any great ideas to share on how you will be doing the Good Book Club with your kids?